-A small house or apartment that you own or rent in a city other than that where your primary home is located, in which you stay when visiting that city for a short time. Owning a piece of New York or “putting a foot in the city” has become a shared aspiration for the global rich, from traditional American and European buyers to cash-flush Russians, Chinese, Middle Easterners, and Brazilians. In recent years, the demand for these super-elite luxury apartments has increased dramatically, creating a whole new typology of skyscraper, the “superslenders,” which are rising on the New York skyline. The problem with this is that not only is valuable real estate essentially wasted, but a high demand for these buildings makes them more profitable to construct than badly needed affordable housing that would address the city’s rampant housing shortages. Some have suggested a tax on pieds-à-terre to deter potential buyers, but the logic behind this is flawed, as extra costs will only serve to make these properties seem more elite, and therefore, more desirable. The Golden Loop represents a satirical perspective on the extravagance and wastefulness of these real estate practices. As opposed to taxation or regulation, the project will engage these properties directly by providing access, both visually and physically, to otherwise forbidden domains. The goal of the project is to re-incorporate the territories lost to the insatiable appetite of the super-elite back into the public sphere by allowing universal access to the amenities that they hoard. Through the act of occupation instead of inhabitation, we are left to contemplate how these two vastly different worlds can exist simultaneously, oblivious to each other’s existence. To illustrate the problem with pied-à-terres, golden volumes have been stacked onto the most significant residences, representing the percentage of each building that consist of underutilized homes. The volumes are, in fact, layered striations spaced 10 feet (3 meters) apart (a typical floor-to-ceiling height) to illustrate the magnitude of the phenomenon. 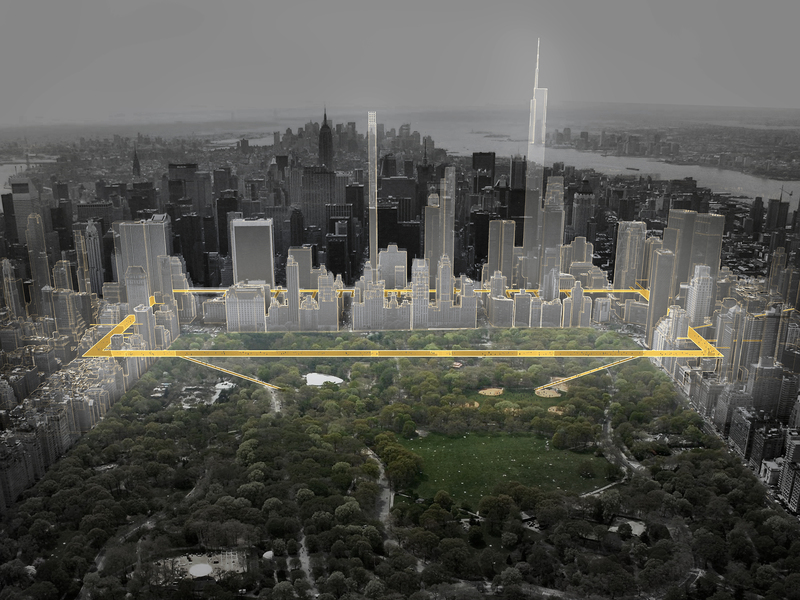 The project’s intervention, an elevated promenade that circles Central Park South and “Billionaire’s Row,” shows how, through occupation instead of inhabitation, the city can gain back its lost space. Through a series of catwalks and elevators that branch off towards each building, views previously reserved for penthouses will be opened to the public, liberating vistas from empty windows.